Colored noodles are a great thing to have on hand. You can make a variety of craft projects and play a variety of learning activities with them. Best of all the kids can help you make them, too. The first time I made these colored noodles, I made them with a 4 year old and 2 year old, so all ages can definitely make these! See the “Working With Young Children” section at the bottom of this post for tips to make it easier for young children. Step 1: Before you invite the kiddos to help make sure you have everything ready to go because once you start, it moves fast! Step 2: Add noodles to each plastic bag or container (about a handful or two). Step 3: Add 5 drops of liquid food coloring of choice to each container. If you are extra brave, you can let the kiddos chose the colors of each noodle batch. Our first time making these we ended up with a lot of green variations because I let the kids choose. Step 5: Seal the container and shake it. Keep shaking until it is evenly distributed! Step 6: Open the bags or containers and let them air dry over night. If you want to dry it faster, you can lay it out on some paper towels but keep an eye on it so it does not stick to the paper towels. When using the bags most of my bags were dry by the next morning. Step 7: As soon as they are dry you can craft away or store in a plastic bag until you are ready to use them. Overall, it was a very easy project and we had no big messes, which is a major plus! Plus, the colors were a lot of fun to look at when finished! I am a believer that these type of craft projects can be made by all ages and can even be a fun sensory activity. These are a few of the tricks I learned along the way. Have everything laid out and measured before you invite the kiddos over to help you. The little medicine cups (the kind that usually come with children’s liquid medicine) were perfect to pre measure the vinegar. The little cup is easier for the little ones to hold and pour than a spoon. Use snack size bags to mix everything up in. There was no worries with the younger ones if the lid was going to pop off and their version of mixing included tossing and dropping the bog. 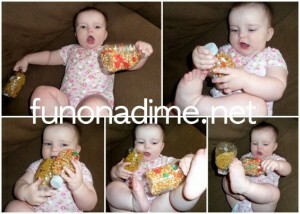 They could even squish the bag which is extra fun for sensory seekers. * This post was originally posted in 2010. We just spruced it up with upgraded pics from Shannon and Bella Bean Photography! And in honor of progress, this is a pic of my 2 young kiddos from the first time we shared this project. This post was one of our first posts on Fun On a Dime and I am so excited of how we have progressed over the years! This would be so fun for holidays!